With three tee boxes, golfers can play the course anywhere from 2,406 to 2,989 yards. For a quiet and comfortable camping experience in Texas, many snowbird RVers choose Lockhart State Park,which offers a reptuable campground plus a well-groomed, nine-hole golf course. Of special interest, the community of Lockhart is the barbecue capital of the Lone Star State. The state park features 20 RV sites among 263 pristine acres. Plus, it`s just 70 miles northeast of San Antonio and 35 miles south of Austin, where RVers can also enjoy exploring Texas Hill Country. Acquired as a state park in 1934, it’s one of many built by the Civilian Conservation Corps (CCC) from 1933-1942. The CCC’s efforts were part of President Roosevelt’s New Deal. In fact, that state park in Lockhart is a public works project to promote environmental conservation and to build good citizens through vigorous, disciplined, outdoor labor. The long-lasting results are evident by the many structures that remain in the park today. For instance, there`s the Recreation Hall at the top of the hill with rock dams and bridges nearby in Clear Fork Creek. 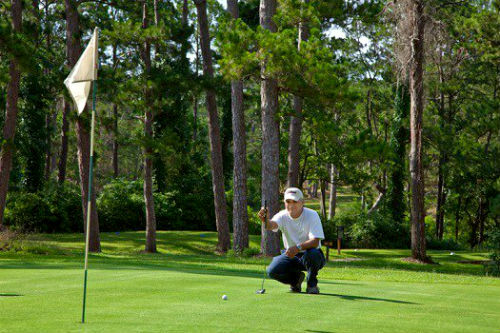 Additionally, some of these quality construction efforts are on the Lockhart State Park Golf Course. Featuring greens that are very small and mostly oval in shape, the par 35 course is typical of CCC courses. They are short, with fairly straight holes. There are no tricks or gimmicks. Plus, with three tee boxes, golfers can play the course anywhere from 2,406 to 2,989 yards. A few doglegs, but the flag is seen from the tee box on the majority of these holes. Small grass mounds – in place of bunkers – that pose a challenge, especially around the greens. A second hole that’s the longest of the links at 518 yards. It’s a par 5 for men and par 6 for women. Many holes that feature tight tree-lined fairways that require accurate shots off the tee. 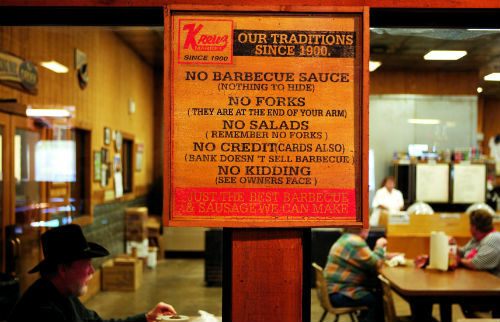 Of course, being in Texas – and especially Lockhart – the barbecue is excellent. For instance, Lockhart is one of the four communities in the area that make up the State’s popular BBQ Trail. The other communities include Luling, Elgin and Taylor. So, after golf, sample any of the four barbecue establishments. These include Black’s BBQ, Chisholm Trail Barbecue, Smitty’s Market, or Kreuz Market. In addition to sampling some of the best barbecue in the state, another attraction worth visiting is The Clark Library. An 1800-era library, it’s the oldest continually operating library in the State of Texas. It`s hard not to miss with its distinguishing two-story Greek cross plan with red brick and limestone trim. If you’re looking for more attractions go on a mission to San Antonio or Austin where more dining and shopping opportunities await RVers.